Aaron Hynds is a Nebraska-based tubist, audio engineer, and composer. His emphasis as a performer is in the reconciliation of standard performance practice on the instruments of the tuba family with the demands made by newly written compositions. At the same time, his focus as a composer and engineer is in exploring the myriad connections between the analog and digital realms. To this end, his works often include electronic components, as seen in several recent works that rely on programs written in SuperCollider and Pure Data. Aaron has been a featured performer across the United States since 2007, particularly in new music venues. He has performed at events such as the inaugural Omaha Under the Radar Festival, the 2014 International Summer Course for New Music in Darmstadt, Germany, the Null Point music series in Buffalo, NY, Constellation-Chicago, and the 2016 and 2017 New Music Gatherings (in Baltimore, MD and Bowling Green, OH, respectively). Additionally, he has appeared as a performer in the 2014, 2015, and 2016 Bowling Green New Music Festivals. Upcoming performances include recitals at the University of Nebraska at Kearney New Music Festival and Bowling Green State University. 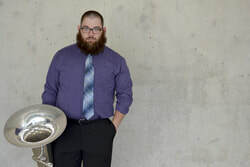 The creation and encouragement of new works for the tuba and euphonium is a vital component of Aaron’s artistic output, and to this end, he has commissioned and performed works by composers such as Kurt Isaacson, Nicholas Deyoe, Eliza Brown, Ruby Fulton, Monte Weber, and Hong-Da Chin. Upcoming collaborations include tuba+electronics compositions by Jacob Gotlib, Kari Besharse, Louise Fristensky, and Ray Evanoff. Aaron is currently recording his first solo project, entitled Colossus: New Music for Tuba, Vols. 1 & 2 and encompassing 14 works that he has commissioned for the tuba and euphonium. In addition, he performed with Ensemble Dal Niente on the Katherine Young/Austin Wulliman collaboration Diligence is to Progress as Magic is to Flight, released in 2014 on the Parlour Tapes+ label. He has appeared as a regular collaborator on albums by ambient group The Midwest Hackers, and recently recorded a doom metal/jazz trio album with collaborators Jordan Snow and Danny Hynds. Besides his work as a performer, Aaron is also a composer and new media artist. Recent premieres include Choke (Radio Edit) for bass clarinet+electronics (for clarinetist Gunnar Hirthe), Sediment for three bass drums and electronics (performed by Ensemble Knox), and SID 6581 for amplified violin and computer (premiered at the SPLICE Institute by Abdel Anzaldua). Upcoming works include Jammer for Eb clarinet+electronics (for Erin Cameron) and hollow town hums for xiao+xun and computer (for Hong-Da Chin). Aaron is currently the Sound Production Coordinator and Events Technician for the Department of Music, Theatre, and Dance at the University of Nebraska at Kearney. He is the primary audio engineer for the Department, and additionally advises the Sound Recording Technologies minor. He is also the Director of Studio UNK, a multi-use recording space within the UNK Fine Arts Building. Aaron has earned Bachelor of Arts and Master of Music degrees from the University of Northern Iowa and University of Wisconsin-Madison, the latter of which he attended as a Paul J. Collins Distinguished Graduate Fellow. He is currently a doctoral candidate at Bowling Green State University, where he is pursuing a Doctor of Musical Arts degree in Contemporary Music. He is lucky to have studied with the following educators, all of whom have directly contributed to his musical, personal, and intellectual growth: David Saltzman, John Stevens, Michael Svoboda, Dr. Jeffrey Funderburk, Dr. Sharon Huff, Thomas Miller, James Culbertson, Steve Schepper, Dr. Jonathan Schwabe, and Dr. Jerome Soneson.